I have been off the radar from the Montreal dance scene for a while and this evening has been a wonderful way to reconnect with all of you. I am truly grateful to Deepa Nallapan, creative head of Param Nrithyalaya who has taken the initiative to organise Natyanjali , an Offering of Dance for Shivaratri. Deeply touched to see the old and the new, the young and not so young, the professionals and the ones training to be, come together in making a presentation by a collage of Indian dancers, who are joyfully and generously sharing their art and artistry. I commend all the groups that are performing here today, as in this process they are building bridges by sharing their culture through dance … a very noble activity indeed. Such is the power of dance to make the world a better place as Moliere , the well known French author , has pointed out, in his play Bourgeois Gentilhomme. An inspirational reminder of how powerful a tool dance can be. l truly believe in Par la danseraprochement et ouvertureand that we can be empowered by dance. May dance make you not only to be good artists but effective activists as well to serve good global causes. Before I conclude I would like to say a few words about Deepa Nallapan’s indomitable act of generosity. 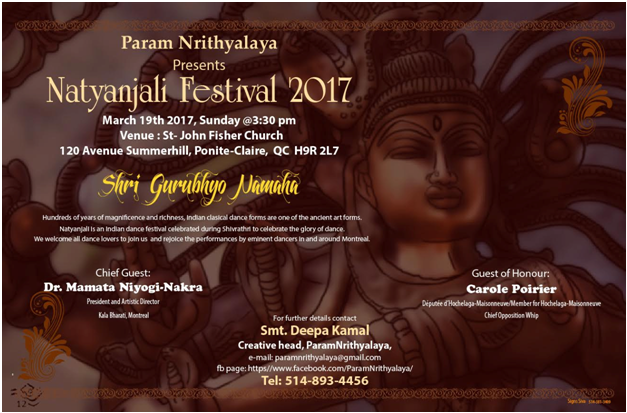 In this age of I , Me and Mine, this young Montreal dancer, in the spirit of sharing, has made a Herculean effort to bring together local dancers under the banner Natyanjali and succeeded. To you Deepa I offer my heartfelt appreciation. You have brought people together. May the Lord Nataraja shower his blessings on all of you for much success in working together.